In today’s yin yang ayurvedic yoga class we are going to balance the 3 doshas. We are going to offer grounding, support and stabilization to the airy vata doshas. We are going to remind our driven and competitive pitta doshas that less is more and yoga is not a competition. Focusing on poses that are cooling and relaxing will gently diffuse the intensity of pitta dosha. We will motivate and stimulate our slow and steady kapha doshas so that they can be energized. 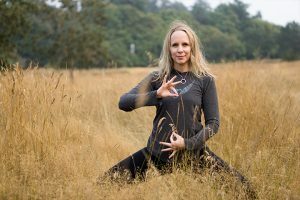 The class will begin with a yin portion that focuses on one pose for each dosha: a grounding pose for anxious vata dosha, a heart opening pose to stimulate calm and steady kapha dosha, and a cooling forward fold to calm fiery and ambitious pitta dosha. From there we will move into the yang portion of this ayurvedic yoga class with a focus on tailoring the yoga practice to each dosha. With each pose I will speak to which poses are best for each dosha. Sometimes specific doshas will be given specific options for poses or asked not to do specific poses so as not to aggravate their dosha. Often times, it will be a matter of how each dosha approaches the sequence so as to balance their specific ayurvedic constitution. Previous post: Can you Practice Yin Yoga Every Day?